How do I get more realistic texture? I have attached a picture of two blocks both made using the STONE10M texture that came with Bryce. Now when I look at the TIF file in a viewer it looks just what I want. In Block 1 to the left you can see it applied in it's natural form. I then applied a 10% bump to the block and ticked. The texture looks blurred despite having a bump - how can I clear this up? The corner of the building looks too sharp for an old building - how can I rough this up a bit so it looks a bit more weathered. Have you read the additions to the posts I put here? http://www.daz3d.com/forums/discussion/7982/ and followed the link to Bryce5.com and downloaded the free material? If yes, then we can talk about that material. If no, then do that, and then we can talk about that material. tdrd Can I ask you a little favour please. It may be easier for people helping you, as a new user, if you keep all your questions in one thread. This makes it easier for people to see what advice you have already been given, and saves people maybe repeating things that you may have already been told. Evneryone is really trying to help you, and we want to see you solve your problems, but lots of different threads do make it a tad difficult to follow your progress. OK - just seen your Dave, will look at that when I get back. Have to pop out to Doctor. In the meantime can anyone resolve the issue of rotating materials. I have created a 3 sided polygon and made it into the roof block. 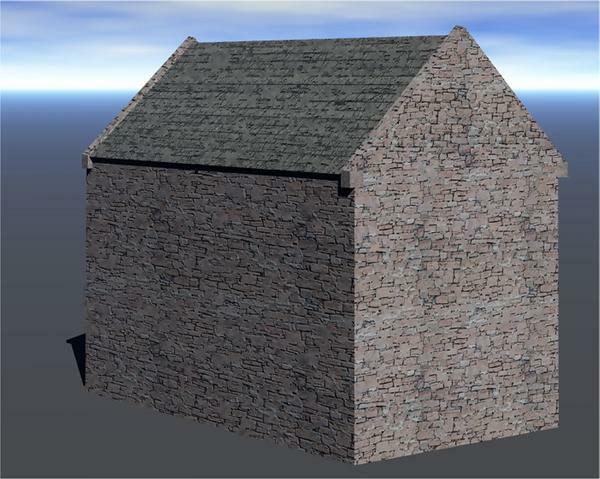 No matter what I do to rotate the materials in the texture transformation tool - I cannot get the stone on the gable end to rotate to the same as the wall beneath it. Why bother trying though? 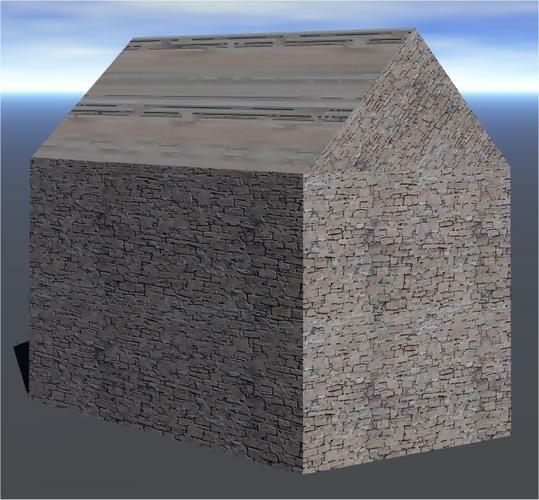 The roof texture for a house like that should be something more along the lines of wood or thatch. For that you need to comprehend mapping modes. There is a lot of scope in such a topic. 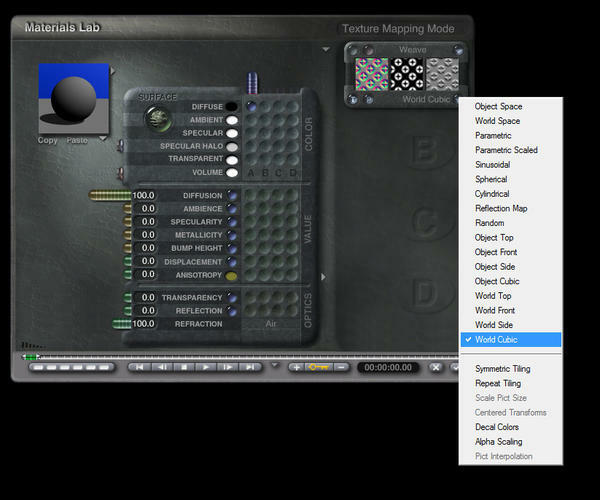 If you use object based or parametric modes then the way the texture is applied will depend on the object not its position in space. 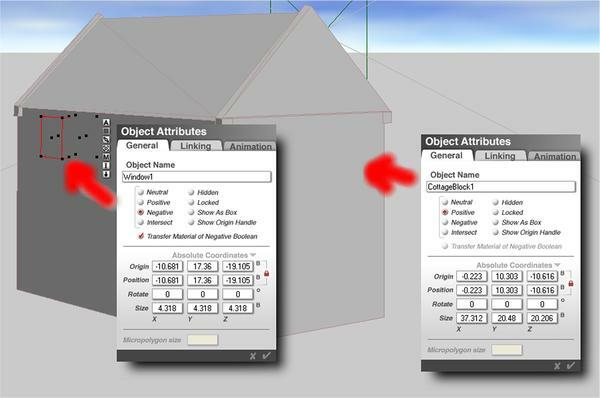 If you use world space then your materials will align irrespective of the position of the objects. For example, as an experiment, switch all your mapping modes to world cubic. 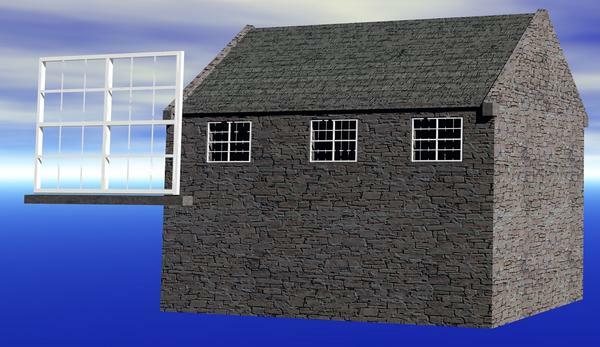 I have made the gable ends two seperate objects and noted the advice about world objects - that's solved the problem. 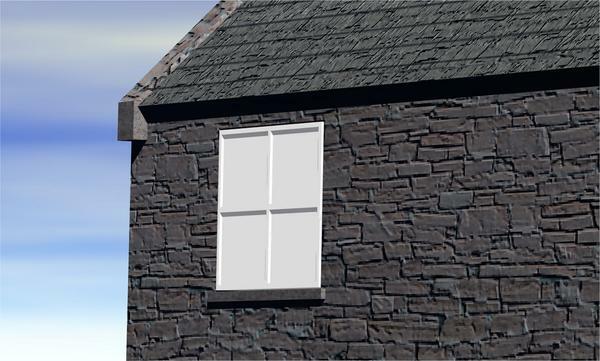 Next question - I have tried to create a block with negative properties to cut holes for the window and door recesses. I have tried all the options in the A option on the object. Please what am I doing wrong? Make your House block positive and your window hole block negative, tehn group them, You need to to do your boolean group before you group the other parts to it. Once you have made one boolean window and grouped it with the main house, you can duplicate the negative cube and move the 2nd one to make a 2nd window etc. Just rmember the main cube and all the neg cubes need to be grouped. then you can group your roof pieces to that group. What you want to keep, set positive. What has to be cut, negative. Be sure that the negative one is a bit thicker than the positive one. Then group them together and there you are. I suspect you forgot to group. OK I set the Cottage Block to Positive. I set the Window block to Negative. I then tried to find option on the screen to [G]roup them but there was no [G] or at all. Once you have them both selected, there will be a [G] (group) button in the list where you have the [A] and [M] buttons as shown just left of the left Object Attributes popup in your picture above. After you clicked on the [G], it will change to an for ungroup. I am a glutton for punishment, My windows are made from cubes stretched to make the window frames and glazing bars and a single sided square for the glass. I know - I have tried to make the cube Positive for the wall. And then tried to put four negative cubes in for the window panes. When I have grouped, there is an option C to convert to boolean. Does this weld all the components together as one object? Suppose I want to make this end product available to others, how would I go about it? Since I cannot make .br7 files available to others, how do I share? The panes are glass but are still showing white!!!??? Having loads of problems situating these vertical slats. I attach a pic to illustrate my problem. In the picture below the vertical slat to the right is too far forward and protruding from the frame. So I moved it backwards ONLY SLIGHTLY and it has disappeared. You can see the parameters in the picture and there is no way it is running behind the transparent box. So please can anyone shed any light on positioning the slat. I AM grouping the slat with the window pane and the window frame. placed on another negative box grouped with a positive wall. I've fiddled and faddled with this for four hours now and there is an increasing pile of hair falling onto my desk! I did not have much to start with! [C] collapses the boolean model into one single object that can be exported and used in another application. [C] stands for collapse, not convert or combine. Once collapsed, it is one single object and you cannot select the individual parts for assigning a material. Slightly? The Z size is 0.700 and you move by 0.346 in the Z direction. That's half and quite a lot. Well I've only played with booleans a little so I don't know much about them. However I do fiddle with things quite a bit and depending on the scale of things in your scene a small adjustment can have a big impact or a little impact. I noticed in your picture that you changed one of the positions from .70 to .35 that can be quite a bit for something you're just trying to nudge into place a little better. I would have started with a change from .70 to .69 first, to see what impact a smaller move would make first and then adjust further once I have a feel for how much the small adjustment changes things. If you're dragging it into place, pressing the 'Option' key whilst dragging will move it in smaller increments. If you're using the number matrix in the Attributes, first select the horizontal window slat and make a note of it's 'Z' coordinates and set the vertical one the same. Another thought occurs to me, when the scene is done and rendered out chances are better then not that people looking at it will not be able to see that these slats stick out a little too far. So you may be pulling your hair out and spending alot of time on details most people might not even notice. Better to save the hair pulling, frustration inducing fixes for things people actually will notice. I don't completely agree with you here, Mark. If the scene is taken out later again and rendered with different lighting and much larger, such flaws become visible. Being careful when constructing is easier than correcting afterwards. What I would suggest to tdrd is to make the objects at least 10 times as large because it is much easier to work that way, and precision is just a bit less of an issue. Well I'm just going by what I remembered of the sketch he did of the scene and I'm thinking that people will be more focused on other elements of the scene like the road and the vegetation and so forth. I'm thinking the house is going to be kind of set back amidst all that and the people aren't going to be looking at it and saying, "This picture looks bad because the glazing on the windows sticks out too far." I could be wrong though as I'm just expressing my personal opinion but unless the windows were a focal point of the scene I doubt I'd notice the glazing on the windows much. Righto, it's all a question of focus. If the model is never intended for closeup view, there is no need to be overly elaborate. When I am aligning elements when I am building something like this I will view the object from Top view, zoom in on the gorup and then move it using the keyboard arrow keys and Alt, which moves just a fraction at a time. Just to elaborate on this a bit more. If you do as chohole is saying when you use the zoom in and out buttons it'll automatically adjust the top camera's position so the item highlighted is centered in the camera's view. Which is a good place to be when zooming in for adjustments. Being a 3D environment when you look at things from an angle and make adjustments you can have a parallax error which in terms of adjusting things in Bryce can mean from where you're looking things look like they're aligned properly but in other views you see they aren't. In wireframe mode this is even easier to have happen. I do notice however that sometimes the zoom feature doesn't seem to center on the selected object. I haven't tested it to confirm it but I suspect that happens when the object is part of a larger group. In which case the camera then is centering on the group associated with the selected object. In that case rather then ungrouping and regrouping you can use the little hand beneath the +/- to center the view. I've been spending 15 hours a day fiddling around so getting used to the interface a bit now. I blew up the window object to 10x and managed to build up the window model. I saved that as a seperate file and grouped the bits and combinrd to object. The building has been duplicated and srunk to create cavity wall. I wish I knew how to give rooms a different light to rid the blackness but for what I need it does not matter I suppose. See what you think of the updated image? I'd say you're on your way. Keep going. You seem to be doing very well, the cottage is looking good. For the light; You can place a light inside the building (lights are the yellow objects on the 'create' shelf. Though bear in mind that each light you add will also add to the render time as the application has to work out all the brightnesses... So probably better doing that once you have the finished cottage in your scene. Yes it's coming on isn't it. I am a tad disappointed about the vertical slats disappearing with the shadows, but I am not about to change that this time with this effort. I wonder - is there a way to turn OFF the shadows of an object?